Inspired by the Museum of Ice Cream in New York and the Color Factory in San Francisco, Arts and Lights is an interactive pop-up art and technology experience; the first of its kind in Malaysia! It transforms a 30,000 sqft space into beautiful and creative art installations filled with fun and colours. Childhood nostalgia is one the themes of the exhibition. Located at Icon City, Petalling Jaya with FREE admission to the public, it only opens on Saturdays and Sundays until the 24th of December, so this weekend is your last chance to catch em’ lights! 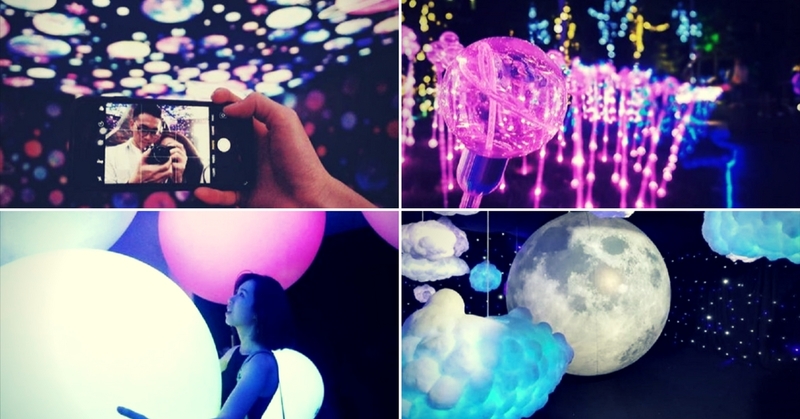 A room filled with giant inflatable balls that light up when you touch it! Where people can colour their own space ships, scan it and see it come alive in a virtual world on a big screen! Where you can wear helmets, pretend you’re in a galactic fight to save planet Earth and, like most people, take a picture in front of the neon sign! Pose with colourful men (literally) in this room where everything’s a bit weird, but super Instagram worthy from every and any angle! I’m that blue fella in the corner when I found out that the admission is FREE. It’s filled with blue and purple fuzzy clouds and has relaxing music for a calming experience, with a giant moon in the middle of the space and little LED stars surrounding you. The whole room is filled with planets and stars that are dimly lit with purple hues, making it an out-of-this-world Instagram shot! At night, the moon swings in the garden lit up in light blue, giving the garden a mythical feel to it. You would look like the Dreamworks logo if you get the right angle! Also at night, the garden is lit up with beautiful lights that make the outdoor space as magical as the indoors.